In my last blog post titled “Paleo or Zone?”, we introduced two of the diets that CrossFit supports – Zone and Paleo. One focuses on quantities of food while the other focuses on quality of food. This isn’t to say there isn’t a natural overlap between the two; if you Zone your Paleo food options you will most likely get the biggest bang for your buck. You may or may not have a general idea of what the Zone diet consists of; the main goal is to bring a balance to your macronutrients to help not only reduce inflammation in your diet, but also help stabilize your hormones, including your insulin levels. Every time we eat our body has to figure out what to do with that food; it becomes an energy source when it is broken down by our hormones and carried to our cells based on what they need. Essentially, food directs a hormonal response which can provide energy to our brain and our muscles in the form of glucose. How can you start the Zone way of eating? 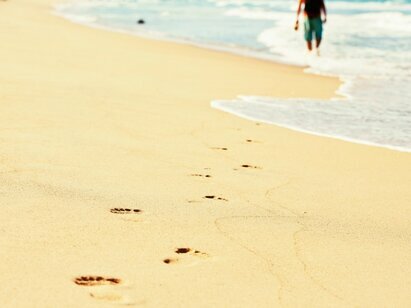 The first thing you need to do is figure out where your starting point is going to be. There is more than one way to figure out your starting point. The easiest way would be to look at the article CrossFit put out back in 2004 – CFJ Issue 21 – Zone Meal Plans. To make things simple look at your shirt size, if you wear a size L than your starting point for a female would be 13 blocks and for a male it would be 19 blocks. Let’s use a male athlete that weighs 170 lbs and has 20% body fat as an example. The first thing you would need to figure out is their lean body mass (LBM). In order to do so we would to subtract their body fat from their total weight. In this case, the calculations require us to find their pounds of body fat. Here, it would be 34 (170*20% = 34). Using this information, their LBM would be 136 (170-34 = 136). Once we have this number we have to figure out the athlete’s activity levels which will serve as a multiplier. Most CrossFit athletes (as in everyday members) are going to use .7 as their multiplier. If someone attends group classes 3-5 days a week and has a sedentary job, this is a great place to start. For someone more active, whose job is more physically demanding and is training closer to ten hours a week, then their multiplier used would be 1.0; a CrossFit competitor or an endurance athlete may need to use this in order to ensure they are getting enough food. In our example, our athlete has a regular job and comes in three to four days a week. To figure out their starting point for how many blocks they will consume, we have to take their LBM (136) and multiply it by .7, which gives us 95.2. Now we can figure out the number of blocks they need to consume. But wait…what is a block? A block is a unit of measurement for food used in Zone. In the last post we mentioned that 40% of our calories should come from carbs, 30% from protein and 30% from fats. One block breaks down to 9g of carbs, 7g of protein and 3g of fat (there’s an assumption that you are going to get some healthy fats from the proteins you eat, therefore you will only add 1.5g of fat per block). 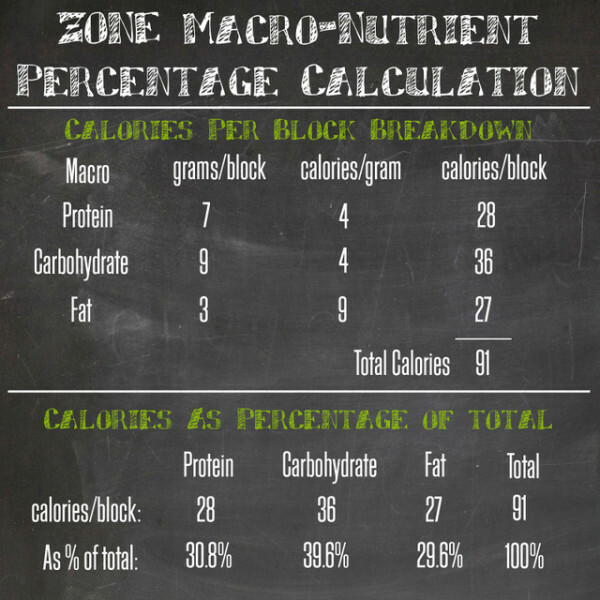 Be sure to look at the CrossFit Journal 21 linked above for more details on blocks and a list of common foods and what their breakdown is per these measurements. Now our example athlete would take the 95.2 and divide it by the 7. This gives a total of 13.6, which we can round up to 14 blocks to start. The Journal article shows what different meal plans look like based on how many blocks you consume daily and how many blocks per meal. This is where our athlete will want to stay for the first three to four weeks in order to establish a baseline from which to work. During this initial period, the athlete may realize this isn’t enough food and they are hungry all the time. If this is the case, add a block or two to the day. In our example athletes case, this would take their total daily consumption total to fifteen to sixteen blocks. When I started doing Zone it was an eye opening experience where I learned how much food I needed to eat. When balanced across my macronutrients I found that I hardly ever needed to snack which meant I was getting a great balance of my protein, carbs, and fats. So what about my post workout shake? What about alcohol? what about this or that? Everything can be weighed and measured, but this means you will need to buy a scale. Amazon sells them for about $20 and with a measuring cup – that’s about all you need. I would recommend printing out the CF Journal article mentioned above and putting it on your refrigerator because you will need to refer to it on a regular basis, especially early on, as you learn the proper portions for each of your macronutrients. After a while I didn’t have to look at it anymore because I had started to memorize the quantities. You need to be strict for at least three to four weeks, which is usually not easy and will require some time and effort. Once you have this dialed in you can start eyeballing your portions in order to make things easier. You may need to make adjustments according to your lifestyle, goals, and/or commitment levels and that’s understandable but do so AFTER the first three to four weeks. Give yourself time to create a baseline before making any changes. As I mentioned before, there’s going to be an adaptation phase that can take up to a month. During this time, your hormones are finding a way to regulate and your body is having to adjust and learn where to get its energy from. Don’t fret and don’t give up! What determines whether you should make changes? Results! It’s important to have markers that you measure so you can see if you are eating in accordance to your goals. 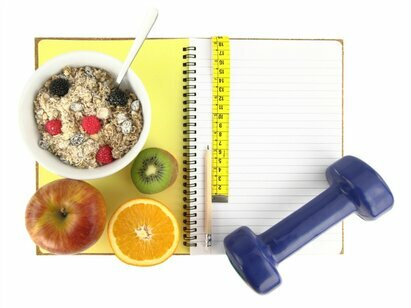 These can be health markers such as body fat measurement, cholesterol, bone density, and muscle mass. You can also use performance measurements to see how you are doing – test and re-test workouts and track improvements. The noticeable body composition changes could take over a month to notice by just looking in the mirror, and tracking how you feel may not be an accurate measurement, at least initially, since your body is going through changes and adapting. In summary, give Zone a try for three to four weeks. We guarantee it will be an eye opening experience in terms of learning the proper portions of what you should be eating. Don’t make adjustments until you complete all four weeks. Look for the next few blog posts which will provide details on the Paleo diet and finally, after that, some tips on how to stick with whichever diet you want that best supports your goals and make it a natural part of your everyday life. A great article on one of the many solid nutrtion plans out there. Article Source Incvictus. Q: Is it possible for me to be a vegetarian bodybuilder? What will I need to do to supplement? You may want to try using 6 grams of essential amino acids after your training sessions in conjunction with 35-70 grams of carbohydrates. Since creatine is only found in animal products, vegetarians show lower levels of the organic acid. This presents a problem because creatine is useful in building the energy source used for those quick, intense bursts called upon while weightlifting. So consider supplementing with 5 grams of creatine a day. Originally published March 23, 2008. Updated August 14, 2015. Consider this a cheat sheet for getting up to speed on the Core Performance system: a glossary of key terms frequently used in workouts, recipes, and other aspects of the Core Performance approach to help you perform at your best so you can live at your best. Practice each concept that’s new to you, or just refer back as you have questions. There will be no quiz at the end, just results you can see and feel. Pillar strength – Relates to the strength of your pillar—your shoulders, torso, and hips. Critical as a foundation for all movement. Learn more. Movement Preparation – Movement Preparation, or Movement Prep, is an efficient warm-up that consists of dynamic stretches designed to lengthen, strengthen, and stabilize your body. Not only will it prepare your mind and body for better workouts, but it will actually make you stronger and help you move more efficiently. Think of it as warming up with a purpose. Movement Prep is typically the first or second training component (following Pillar Prep) in Core Performance workouts, but you can also perform it anytime, anywhere. Learn more. Eating clean – One of the fundamentals of Core Performance nutrition, eating clean means choosing healthy, natural, and minimally processed foods to fuel your body. Learn more. Energy Systems Development – ESD is the cardiovascular component of Core Performance training programs. The intensity of the workouts is broken up into three different heart rate zones, which are differentiated by color: Yellow is easy/recovery, green is moderate/strength, and red is hard/power. Instead of slow, plodding workouts, ESD will have your muscles, nervous system, and hormones acting together to help your body work as efficiently as possible. Learn more. Active isolated stretching (AIS) – Type of stretching in which you use a rope to gently assist in pulling a muscle a little farther than your body would normally allow to increase flexibility gains. Learn more. 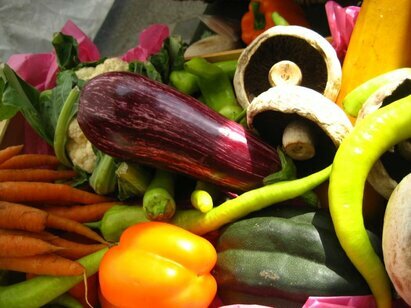 Phytochemicals – Pronounced “fight-o-chemicals,” these substances can help protect you from disease and boost performance. Learn more. Active recovery – Low-intensity activity, such as golfing or an easy jog, designed to help your body recover for your next workout. Used interchangeably with “active rest.” Learn more. Passive recovery – Passive recovery involves things like massage that require little to no effort. Learn more. Low split stance – One foot forward and the other foot back with your knees bent so that your back knee is just off the floor. This may also be referred to as a split squat position. See example. Functional Movement Screen (FMS) – The FMS is a series of seven movements designed to highlight weak links or compensations during movement that over time may lead to pain or injury. From this screen, we can prescribe movements designed to improve movement and decrease the potential for injury. Metabolism – Process by which your body converts food to energy, sometimes referred to as your “fat furnace.” Learn more. Recovery session – Light workout used to help the body feel better (e.g. find relief for knee pain with this recovery session). Mobility – Ability to move your body in an efficient manner. Learn more. Trigger point – An area of deep muscle tissue that we isolate and release using movements. Trigger point movements should feel like a deep massage. Learn more. Mindset – Mindset at Core Performance is about walking into a situation or working toward a goal with a full understanding of what it requires and how to accomplish it. For long-term success, it’s important to create a game plan that will help guide you and keep you motivated toward a big-picture lifestyle change. Developing the proper mindset will prepare you for everything that comes your way. Learn more. Nutrition – Nutrition at Core Performance is seen as a way to fuel your body for optimal energy and production, not as a way of dealing with stress or curbing emotions. The path to success isn’t about deprivation, but instead it’s focused on being proactive with your health by combining nutrition and exercise for maximum results. Learn more. Pushing through your hip – To squeeze your glutes and push off your leg. Proprioception – Ability to know where your joint is in space—for instance, when standing on one leg—due to a system of pressure sensors in the joints, muscles, and tendons that provide the body with information to maintain balance. Learn more. Regeneration – A critical component to any training plan, Regeneration restores balance in your body, helping to relieve aches and pains while enhancing your body’s response to training. You’ll stretch, massage, and recover to recharge your mind and body. Think of it as preparing for your next workout. This training component often appears last in a workout or standalone. Learn more. Training phases – Core Performance training programs progress through a series of phases. Each phase has a different emphasis. Learn more. For the complete list, see our glossary. For Christmas this year, how would you like Santa to help you look leaner, get stronger, have more energy, live pain-free, appear more confident, get a raise at work, look younger, breathe easier, boost performance, and even grow an inch taller? Would that be the icing on the fruitcake, or what? Well, I’m here to tell you that no matter how naughty you may have been this past year, it’s all possible. The only thing you have to do is sign on for this month’s One Small Change experiment. Then, for the next 31 days, we’ll set out to improve our posture, which is the simple, overlooked key to getting all these gifts. Posture doesn’t get much respect from athletes because they think it’s the domain of prissy etiquette experts. But I’m not Miss Manners, and this program isn’t going to entail walking around with books on our heads. Posture is the secret weapon to enhancing performance and—no exaggeration—life itself. Indeed, not since Neanderthal days has there been a time when poor posture was at such epidemic proportions. Although Falsone points out that everyone is born with perfect posture (“just watch little kids sit, walk and pick things up,” she says), we lose it by sitting for long periods, doing repetitive movements, and not stretching regularly. In fact, you’re probably reading this right now hunched over some computer or phone. Look at the tops of your shoulders; they should be level. Imagine there’s a vertical line splitting your body in half from your nose through your crotch; the right and left sides should be mirror images. Shoulder blades shouldn’t be visible; if they are, your back is rounded. Spine should be straight; any outward (convex) curve signifies slumping. Imagine there’s a vertical line running from the middle of your ear to the floor. It should bisect the middle of your shoulder and the boney protrusions on the outside of your hip, knee, and ankle. If these checkpoints are forward or behind the line, or you noticed any of the other imbalances mentioned, you’re out of whack and your posture needs work. Falsone has designed a special workout for us that will strengthen the most-important postural muscles. Plus, she’s assembled a bunch of quirky little exercises involving everything from Post-It notes to duct tape that can be used as reminders throughout the day to—as you’re mother probably yelled—“Sit up straight!” I’ll deliver both in my next blog post. Join me for the ride, and maybe Santa will come through, too.